The day can be challenging… you’re always on the run and we know what it’s like. To make it through, you need an energy bar that fits your lifestyle. Fuel up with a ProteinFX bar, our original great-tasting protein hit on-the-go – packed with 20g protein it helps you stay on top of your game. 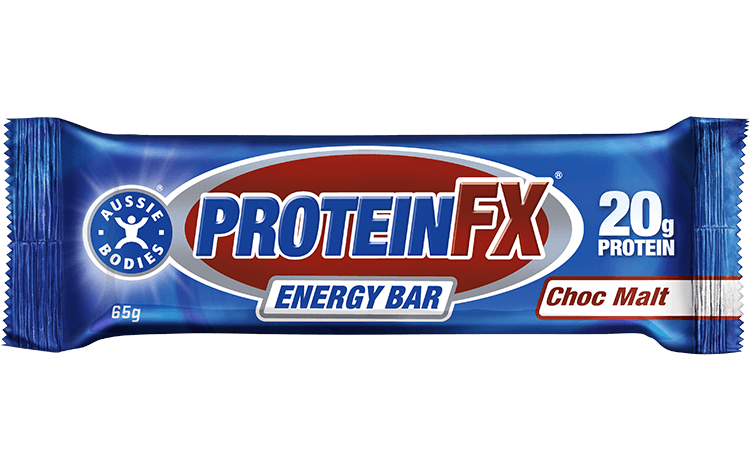 Ingredients: Aussie Bodies® protein blend (34%) [soy protein crisps (soy protein isolate, tapioca starch, salt), whey protein concentrate] protein milk chocolate (26%) [maltitol, cocoa butter, milk solids, cocoa liquor, soy protein isolate, emulsifier (soy lecithin), flavour], Fruitrim® (fruit juice, grain dextrins), glucose syrup, EnergySmart® (fruit juice, grain dextrins), flavour, cocoa powder, glycerol.